Trailer: English dubbed trailer for the first Rebuild movie. What it’s about: Shinji Ikari did not set out to be a hero. In truth, he’s not qualified for the role, and he knows it. But when the alien “Angels” responsible for devastating Earth 15 years ago reappear and begin to lay waste to Japan once again, he’s told that only he is capable of piloting the Evangelion weapon system developed to defend humanity. Reluctantly, Shinji steps up. But there are good reasons not to place the weight of the world on the shoulders of a fourteen-year-old boy. Why you should watch it: It’s not hyperbole to say that Neon Genesis Evangelion has a claim to being the greatest anime series ever produced. Others might have a more general appeal, or spin out a more epic tale, or have slicker production, but the impact that NGE has had on the medium since its first broadcast cannot be overstated. It would be worth a watch just to be able to pick out all of the references and allusions to it in your other favourite series, but on top of that it’s actually a good story. Binging through the whole show is far too easy. The characters are believable in their actions and motivations in a way that’s quite rare, there’s enough action going on to satisfy any mecha fan, and there’s enough depth to keep the attention of a more cerebrally-minded audience. The direction is supremely self-confident, and the writing doesn’t beat you over the head with its intent. It’s a show that has a lot to offer, and thoroughly deserves its reputation. Caveats: To get it out of the way, this is quite an old series and it shows in the artstyle and animation. It actually holds up a lot better than its contemporaries, but for a viewer accustomed to modern anime aesthetics, it’s going to take a little getting used to. 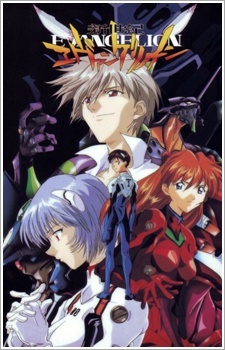 Secondly, the watch order: watch the original series all the way through, then watch the movie End of Evangelion. Give it a while to percolate before trying out the Rebuild movies. Themes: Um, well. There have been entire theses written on this show and the different meanings and interpretations that can be pulled out of it, so I’m not even going to attempt a full summary. It’s safe to say that there’s a lot of Freudian subtext going on throughout, and the idea of the “hedgehog’s dilemma”, the yearning for close relationships coupled with an inability to commit or engage on that level without hurting one another, is a pretty central theme. Facing up to one’s responsibilities and the personal struggle with both depression and self-loathing is another. Similar works: Madoka Magica is often brought up in the same breath as NGE for being another show that reflects and reinterprets the assumptions of its own genre. To see where Anno started off, try his directorial debut Gunbuster. It’s a little rough around the edges, and is a much more traditional mecha action show than Evangelion, but the connections between the works are there to see if you want them.